Akiko Kimura was born in 1970 in Tokyo. Learned ballet dance and street dance in her youth, she studied dance theory at Waseda University and began to build a professional career as a choreographer in show business while still in her teens. She choreographed many pieces for commercial films, fashion shows and plays. In 1994, she founded her own company Leni-Basso. 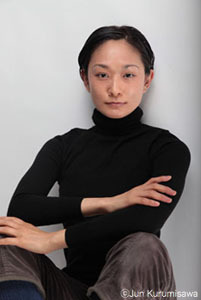 In 1995-1996, she stayed in Germany for a year as a resident artist sent by the Agency for Cultural Affairs of Japan and observed the situation of contemporary dance in Europe. In 2001, she was invited to Bates Dance Festival to create two short pieces: a group piece in collaboration with the dancers participating in the festival and her solo work Face-Mix by which she attracted great attention and won recognition in the U.S. She created one of her master pieces Finks and performed more than 60 times in many countries.In 2003, she was invited to ADF (American Dance Festival) to create a short piece titled Enact Oneself with ADF dancers for the International Choreographers Commission Program; the piece was chosen as one of the best dance of the year in North Carolina. In 2005, at the request of the Group Motion Dance Company of Philadelphia, she made and premiered Rondoin Philadelphia. Created ghostly round for In Transit 2005, organized by Haus der Kulturen der Welt in Berlin, and premiered on June 2 and 3, which was later performed around the world as her repertory.In 2007, she made a commissioned work named “Blind Trip”-SKIN Project for ACE Dance and Music of Birmingham, UK, and it toured 20 cities in the UK in 2007/2008. In 2011, she created a full length piece ICE for the same company, and it toured in the 2011/2012 season. On another occasion, she acted in two movies: Pulse (Kairo), which won a prize at the Festival de Cannes and Grand Illusion (Oinaru Gen-ei), both were directed by Kiyoshi Kurosawa. Art Zoyd, a famous French avant-garde rock group, made a video opera based on the movie Kairoand Akiko choreographed and acted as a performer in the opera. The opera was premiered in France on December 11, 2009. She choreographed and danced in Black Particle, a choreographic video concert by Art Zoyd (its world premiere was on November 20, 2010 in Enghien-les-Bains). During 2011-2012, she engaged in a co-production project To Belong with Komunitas Salihara in Jakarta. To Belong-cyclonicream- was premiered in Japan and Singapore in 2013-2014. To Belong/Suwung (newest version) was performed in Dance New Air festival 2014 in October 2014, at Aoyama Round Theater, December 2014 at Geothe Haus in Jakata, Teater Besar ISI-SURAKARTA,in Solo in Indonesia. She choreographed for Tari Opera Gandari in Jakarta December 2014. March 2015 she choreographed solo piece rout 1 In between 1 Second and Eternity in Tokyo. ACC Fellowship Grants to Individuals 2015, Japan-United States Arts Program/Saison Foundation Fellow. March 2016 she started an international collaboration with South East Asia 2rd series"Cross Transit project". The Newest piece was premiered September 22 2016 in Matsumoto Performing Arts Center and September 29-30, October 1-2 at Theater Tram in Tokyo.January 6-7th 2017 her solo short piece“TranSenses”was premiered at Japan Society in New York. Akiko Kitamura, who was soon recognized as the most thrilling dancer in Tokyo. Making its own contribution to the questioning and experimental spirit within the stream of contemporary dance worldwide, Leni-Basso continues to explore the potential of dance and its own discourses of communication. Sound and silence; light, shadow and projected figures; floor, walls and objects on stage; and bodies - these are the normal media of the dance stage. We invest in these the characteristics that form a context for dance, from the elements in the multimedia space. The potential corporeal intensity is drawn out to the fullest extent possible from each medium, before the communication of semantic content. Each medium expresses itself through the development of the interplay in the space, which is organized as a matrix of dance rather than a platform for representation. The pulse of the interplay between the media, like a vital fluid, provides the inspiration for dance in a space of intercommunicating media. To the corporeal memory, an important part of the mechanism of dance, there are two ways of approaching a work: to memorize the dance movements, or not to memorize them. If the movements are memorized, corporeal memories - individual or inherited - are traced and collected, and memory is given form in movement. If they are not, the sensations evoked in the body are too insubstantial to give form to a motor image: the mechanism for constructing motor memory fails to work. At this point comes a critical moment: the mind is left behind and the body is allowed to express itself corporeally, to dance an incident never memorized. We dance from both traced memories and incidents never memorized. Using the vast field of memory as cross-memory territory, we explore through dance how these two ways can meet. The body is the most fragile medium on stage. Exposed to the interplay of media on the stage, its fragility induces in us a variety of sensations, sometimes even an uncertainty about the nature of our being. Just as in film the interplay of light, darkness and perspective may confuse our senses about to the existence of what is before us, and an object on screen may appear to be something in the realm of the spirit, on stage a dancing body may deconstruct the apparent reality of our sense-perceptions, introducing us into a world where the line between the corporeal and the spiritual becomes blurred. Let the body become still more fragile and sensitive and a dance may pass through this passive - but dormant and thus potentially active - body, evoking passion. Passing through, passive, passion: the way these three words interplay elucidates the relationship between them. Their expression through dance can bring us to a state of intense emotion. The choreography of dance is devised to develop the interplay; the dramaturgy of dance to lead the body to this state. The greatest pleasure we hope for is to share such a special experience in space and time with our audience.